Friendly reminder for next Monday’s Latino Faculty, Staff and Administrators Association’s monthly meeting. Also, if you have any agenda items please make sure to get them to Ed Gomez by Friday, April 26, 2019. 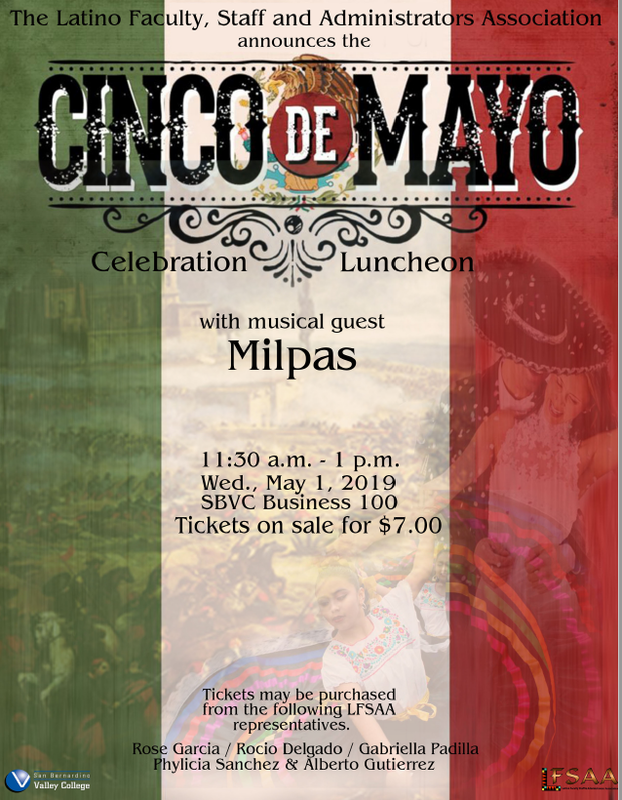 Our Cinco De Mayo celebration is right around the corner! In order to make this a successful event, we need volunteers and much needed donations. We currently have several members who have committed to donating food, supplies, and volunteering their time on the day of the event. However, we are still in need of additional assistance. Please take a look at the items listed below and let me know if you can assist us in any way possible. Also, make sure to get your tickets because they are going fast. We hope that you can come out and join us for some delicious food, music, and fiesta! Tickets are still being sold for $7.00 per plate with all proceeds going to Nuestra Graduación and LFSAA scholarship fund. Thank you for all your continued support and for being a part of the Latino Faculty, Staff and Administrators Association. This is a friendly reminder for the 20th Nuestra Graduación sub-committee meeting scheduled for tomorrow. Please keep in mind that this is our biggest event yet and we need all hands on deck. Your cooperation and support is extremely needed. Thank you and we hope you can join us. If you have not done so already, please continue to reach out to businesses that you patronize in order to help raise funds for Nuestra Graduación. As you know, the event is fast approaching and we can most certainly utilize all the funding that is raised in order to make this 20th celebration a complete success. Ask any business that you patronize if they would like to consider donating money in kind or by directly placing an “ad” in our program this year which will help us fund the ceremony. 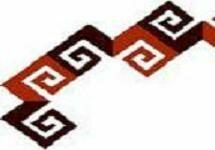 There are attachments with this email that include all the pertinent information that you may need. Any questions, please feel free to contact Ed Gomez. Please continue to reach out to businesses you patronize in order to raise funds for Nuestra Graduacion. Ask them if they would like to consider donating money in kind or by directly placing an “ad” in our program this year which will help us fund the ceremony. There are attachments with this email that have all the pertinent information that you may need. Any questions, please feel free to contact Ed Gomez. Please come out and support M.E.Ch.A. 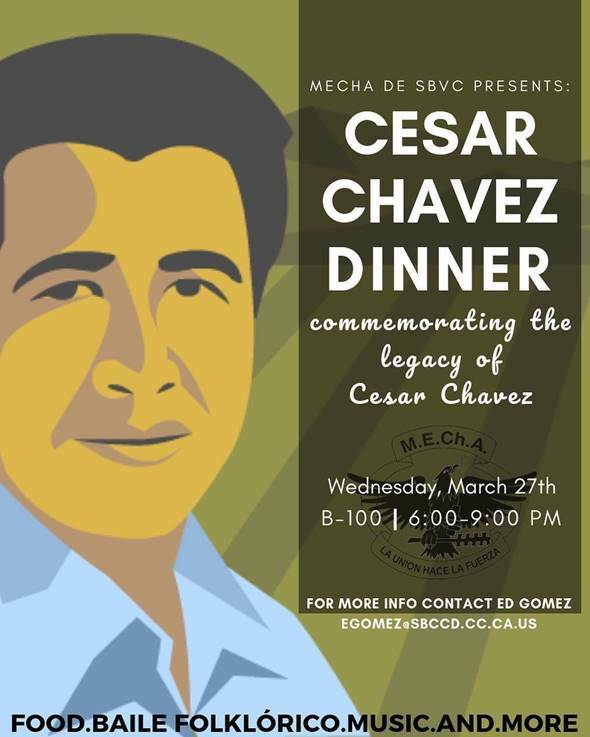 this Wednesday, March 27th to honor the life and legacy of Cesar Chavez. We are also asking for drink donations. Please contact Ed Gomez if you are willing to donate.